One area of location-awareness that has not been explored very much yet is recommendation systems. The current crop of apps - from Foursquare to Skout - lets you connect with people and places around you. But there is a lot more that could be done with all the data that is generated by local user activity. What if you could get recommendations for music, movies or apps based on the people you meet - even without asking them? 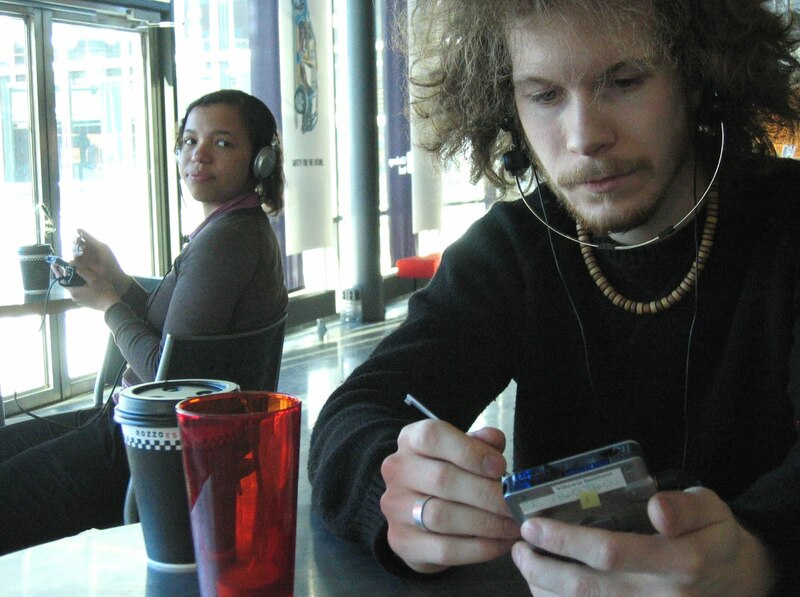 In 2005, we came up with Push!Music, which was developed by Mattias Jacobsson and Mattias Rost. My idea was to extend the ordinary portable music player (and remember, this was before the iPhone and iPod touch, so most MP3 players were very limited) to give it an awareness of the music that the people around you listen to - and use that to give you new music. We introduced the notion of "media agents", meaning that every single song in your collection was an intelligent agent, capable of knowing when you listened to it, if you skipped it over, and so on. Furthermore, the agents (i.e. songs) could use the local wireless network to peek into other players nearby - and if they thought they would be played more often there, they could "jump over" to another person's player! This meant that while you were listening to your own music, songs from other users nearby could decide to come to you and insert themselves into your playlist! You would literally get new music not from some abstract recommendation engine on the internet, but from people you passed on the street, rode the bus with, or shared office space with - whether you knew them or not. This system was implemented on handheld computers, and my student Maria Håkansson performed a number of studies on Push!Music with up to 10 users over several weeks. One interesting addition to the original idea was the capacity to manually send - or "push" - music to other users. This came out of the observation that people find it just as much fun to recommend music to others as to receive recommendations. So what happened? It turned out that people enjoyed getting recommendations from people around them - it felt "more alive" as one user put it. But Maria also found that people were very reluctant initiate contacts in the real world, even though they had been sharing music and were in the same location - this observation still holds for the many location-based "contact initiator" apps we are seeing today. Finally, an interesting issue arose around the sending and receiving of songs. Getting a song felt like a "gift", and when you receive a gift the polite thing is to thank the giver and tell her what you though - but we had failed to include such a capacity. This made users hesitate to send songs manually, because they did not know what the user would think, and had no way of finding out. However, the automatic recommendations - done by the media agents - carried no such obligation! Therefore, users really enjoyed sharing songs automatically the system - it was both from "real" people around them, while at the same time not introducing the awkwardness of the gift giving. (These are lessons that Microsoft could have used a few years later, when they introduced a similar manual sharing capability in their ill-fated Zune music player.) You can read more about the study in the paper Gifts from friends and strangers: A study of mobile music sharing. Today, people are sharing media in close circles through apps like Path and Instagram, but I believe there is still a lot of room for recommendation-based systems based on the people around you. Wouldn't it be cool, for instance, if you could see what movies your neighbor was watching on their tablet (provided they allowed you, of course) and get it to your own device, maybe even start a conversation around it? Or if you could share music recommendations with the people in the bus on the way to work in the morning? As technology advances, I am sure we will see a lot more happening in this space!